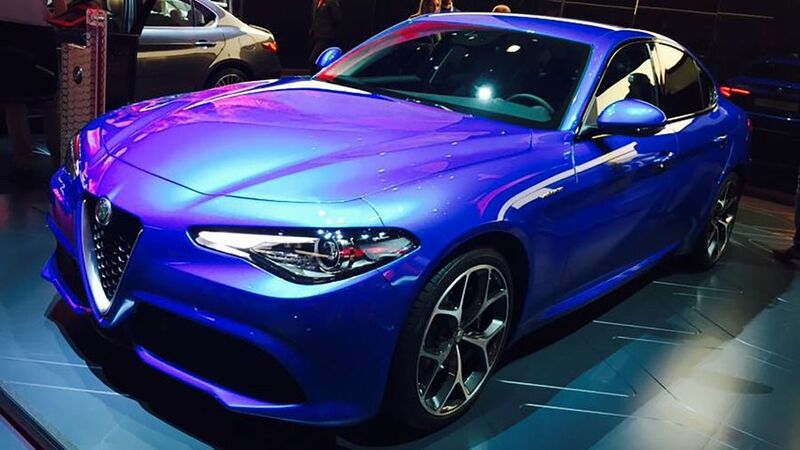 Alfa Romeo has revealed a new high-performance version of its stunning Giulia saloon on its Paris show stand; called the Veloce. Not content with taking on the BMW M3 and Mercedes C 63 AMG earlier this year with its 500bhp four-door Giulia Quadrifoglio, Alfa is going after buyers who want a fast, pretty saloon but can’t reach the £60,000 price of the QV. The Veloce is available with a choice of two engines, one petrol and one diesel. The diesel motor is a retuned version of the 2.2-litre in the standard car, stoked to produce 207bhp and 347lb ft of torque – modest improvements from the 178bhp and 332lb ft you get in the everyday version, but enough to warrant the fitting of a new ‘Q4’ four-wheel drive system. 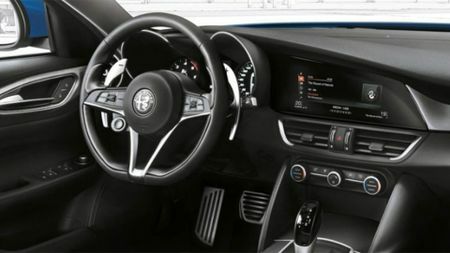 In normal driving, the Giulia Veloce still sends power to the rear, but when required, this all-wheel drive system can send up to 60 per cent to the front wheels to improve traction, but adds 60kgs to the overall weight. As the popularity of Audi’s Quattro and BMW’s xDrive systems shows, buyers of premium saloons now demand the option of four-wheel drive. 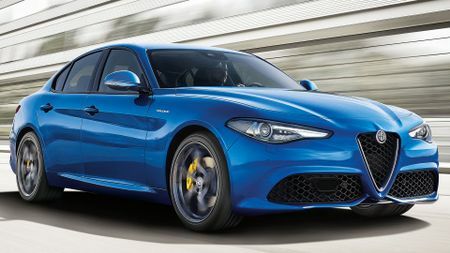 Unfortunately, this four-wheel drive system is not currently compatible with right-hand drive cars, so if the Veloce does make it over to the UK (Alfa currently says the model will be rolled out slowly across Europe) then it’s likely to be rear-wheel drive only. Both feature an eight-speed automatic gearbox as standard. On the plus side, the other engine option, a 2.0-litre turbo with a healthy 276bhp, could be quite entertaining, given the excellent handling balance of the standard model. Of course, this increase in performance has coincided with sharper styling, with plenty of visual clues to help set the Veloce apart from standard Giulias. 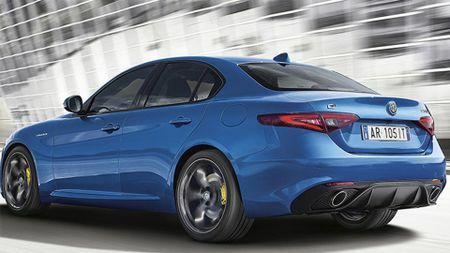 The styling upgrades include sleeker bumpers, and some of the aerodynamic look from the Quadrifoglio, with similar 18-inch alloy wheels, twin exhausts that sit flush with the bumper, a rear diffuser, tinted rear windows and Xenon headlights as standard, plus an exclusive colour – Blue Misano. 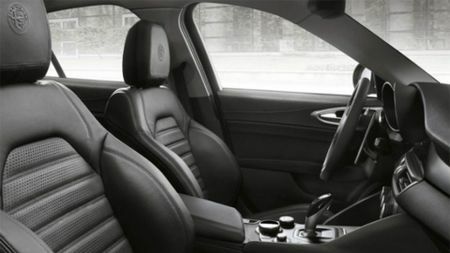 On the inside, you’ll find black leather, brushed aluminium dash inserts, and a sportier wheel and set of pedals. Without a confirmed UK on sale date, pricing information is not available at this time – but if it does appear in British showrooms, expect it to start at around £42,000.